I suppose a hat could be something other than hat shaped (like a cow shaped hat), but I find the title of this pattern silly enough (in a good way) to want to knit it. Welcome to my construction of the Hat Shaped Hat! 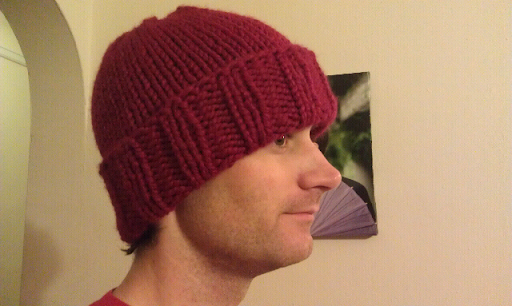 I used ~136 g (85 yards) of Wool ease thick and quick on size 13 knitting needles. 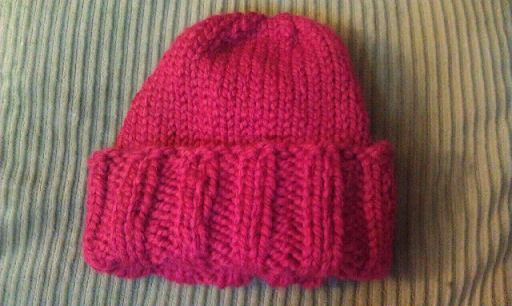 This hat was certainly thick and quick to knit, easily finished in an afternoon. My gauge is fine for width, but a little short for length. 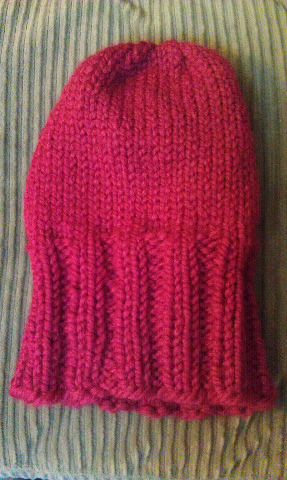 Therefore I did #17 total rows of ribbing to get ~ 5" of ribbing. I followed the rest of the directions as written and BOOM a wonderful watch cap. (Sorry, a "hat shaped" hat.) What a great pattern to now have in my library. You know what that hat reminds me of? A hat. It is great. I like a full amount of ribbing for a roll up too. Great work.